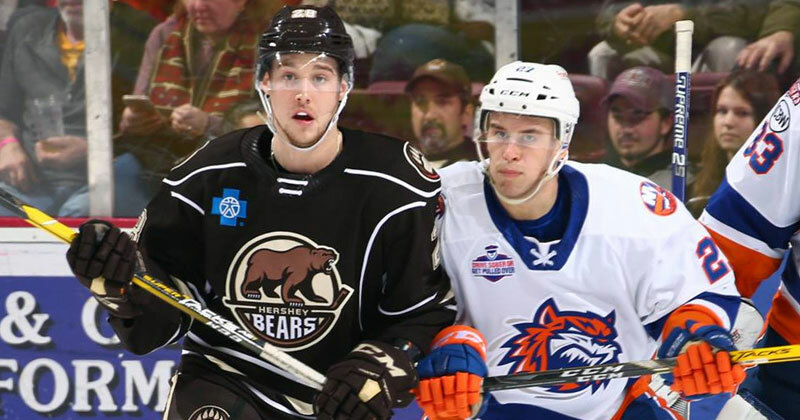 04/15/2019 - The Hershey Bears have announced the schedule for the club's first round playoff matchup with the Bridgeport Sound Tigers. The Bears, the 3rd place team in the Atlantic Division, will open the 2019 Calder Cup Playoffs presented by CJ's Tire and Automotive on the road at 2nd place Bridgeport on Friday, Apr. 19. *Game 4-Thursday, Apr. 25 vs Bridgeport, Giant Center, 7 p.m.
*Game 5-Saturday, Apr. 27 at Bridgeport, Webster Bank Arena, 7 p.m.
*If Necessary. All times are Eastern. Tickets for Hershey's home games go on sale on Tuesday, April 16 at 10 a.m. Tickets will be available at the Giant Center Box Office, by calling 717-534-3911, and online at Ticketmaster.com.